The sea pen is a soft coral that earned its name because it looks like an antique fountain pen. Sea Pens are known to live in colonies, and are made up of 14 different families. They can be found in the tropical and moderate climates. As an octocoral (soft coral), the sea pen is made up of polyps. Other members of the octocorals include sea whips and sea feathers. 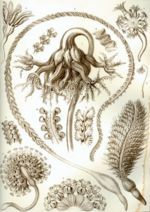 Sea Pens - 19th plate from Ernst Haeckel's Kunstformen der Natur (1904). 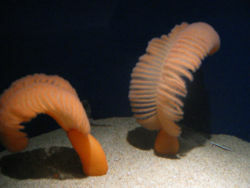 The sea pen is named for its feathery appearance. The sea pen has a bilateral symmetry. It is actually just one big polyp. The polyp starts out very large and then loses its tentacles, making the central axis. The base of the main polyp forms a bulb (peduncle) which digs into the ground and anchors itself into the sand. Some species of the sea pen can grow to be 2 meters above ground. Sea Pen with tube anemones in the fore/background. An unidentified sea pen shares a pit with a shrimp. This page was last modified on 21 June 2010, at 01:57.